The catfish is one of the most easily identifiable fish on the planet, and catfish in Lake James are no exception. Numerous barbels are located around the mouth which resemble the whiskers of a cat, giving the fish its name. The catfish is as desired by anglers because of their unique physical appearance, excellence as table fare and great sport, especially in catching larger specimens. So, what kind of catfish can you catch in Lake James? There are various species of catfish that live in the lake. Able to attain sizes larger than 30 pounds, blue catfish thrill anglers in search of catching one of the biggest freshwater fish species in Lake James and all of North Carolina. Channel catfish are targeted for sport, but more commonly for their value as the angler’s next meal. Additional catfish found in the lake include bullhead catfish and the white catfish. Like some species of fish in Lake James, not all catfish are native to the Catawba River drainage. 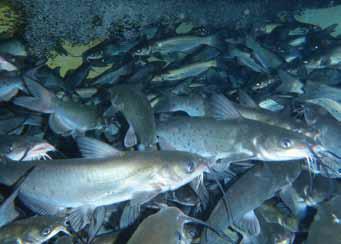 While bullhead and white catfish are native, blue and channel catfish are native to the Mississippi River drainages and have been introduced to Lake James to support sport-fishing opportunities. in feeding, catfish generally have small eyes. All four of the catfish species mentioned have mouths that are located on the bottom of their heads. The location of their mouths and barbels help catfish feed along the bottom of the rivers and lakes they inhabit. Examining the body of a catfish, you will notice they lack scales; another interesting characteristic of catfish. Some species are known to have plates or scutes used for protection, but the species in Lake James don’t have either. Catfish have large, powerful tails for propulsion, but the dorsal and pectoral fins are of special concern for anglers. Located on the leading edge these fins are bony barbs used as defense. They can be locked outward into place and can inflict painful wounds if an angler or predator doesn’t negotiate them properly. Catfish of Lake James range in color from the light grey/blue coloration in the white and blue catfish to the dark brown coloration of the bullhead catfish. The sizes of these catfish range as much as their coloration. Bullhead catfish reach a modest size of 18 inches, while the channel catfish can grow to 30 inches or larger. More impressively, the blue catfish can attain lengths of over 40 inches and weigh more than 30 pounds. In fact, the North Carolina state record blue catfish was caught in Lake Gaston and weighed an impressive 117 pounds and 8 ounces. Locally, the North Carolina state record white catfish was caught in Lake James in 1990 and weighed 13 pounds. So, how can you catch a catfish in Lake James? As with any fish, you must discover what they eat. Fortunately, catfish eat pretty much anything they can fit in their mouths. Smaller fish, crayfish, worms and insects make up most of their diet, and using these as bait can lead to success when fishing for catfish. Additionally, man-made baits such as “stink” baits, hot dogs and other processed food will also work. Catfish are bottom feeders, so baits should be presented accordingly. Catfish can be caught during the day, but the best time to catch them is late evening, through the night and into morning. So, the next time you are at Lake James, bring a fishing pole and some catfish bait. One state record has already been caught here. Will you catch the next?